The submitted widget will be displayed with the tag [RSS]. This RSS feed subscription button certainly stands out. With this widget, automatically set up RSS Feed subscriptions to Google Reader, My Yahoo, Hatena RSS, and other Japanese feed readers. RSS, blog, mini-blog, and SNS feed aggregator that displays recently updated articles. 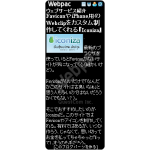 Bloglue does not typically recommend Japanese widgets that require registration since this requires Japanese language skills. However, if there is enough interest, we will provide a set of instructions. Please let us know by commenting. 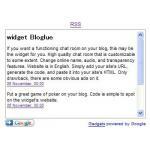 The feed aggregator shown on this page displays the most recently submitted widgets to Bloglue.